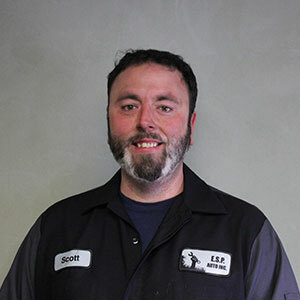 ESP Auto Inc., Meet our Team: Scott Healy | ESP Auto Inc. I am ASE-certified in engine repair and brakes and am renewing other ASE certifications in manual drive train and axles, suspension and steering, electrical, heating and AC and engine performance. I am a graduate of Smith Vocational automotive department. I handle the general under car repair including transmission, drive train, suspension, exhaust, brakes and maintenance. I love going snowmobiling, camping, fishing, and spending time with my family.